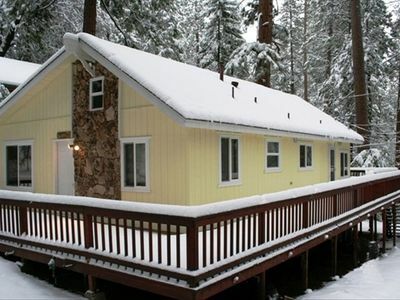 Our cozy, yet spacious chalet is located where Mi-Wuk Village meets the Stanislaus National Forest. 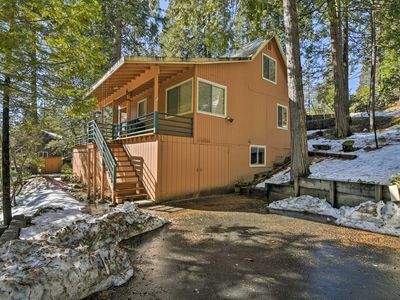 The chalet is on over half an acre and has three levels with more than 1600 square feet. 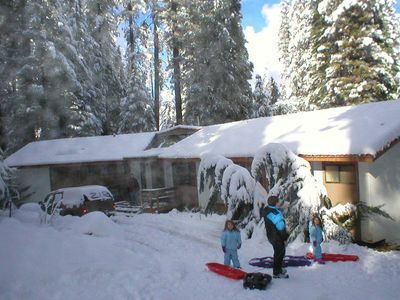 Mi-Wuk Village is above the snow line, yet only 150 miles from the Bay Area. 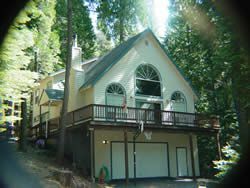 The main floor opens into a cathedral ceilinged room that includes the living room, dining room and kitchen. 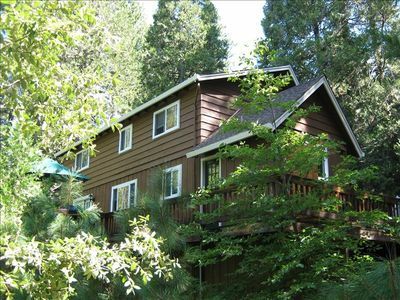 Two sliding glass doors lead out to a large deck with a beautiful view of the forest and the sounds of a stream. 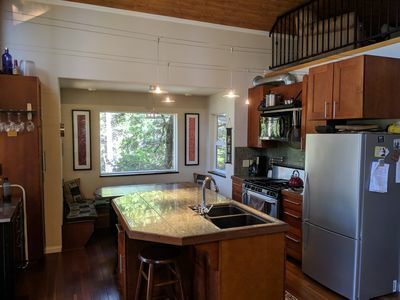 This floor has two bedrooms and a full bath. 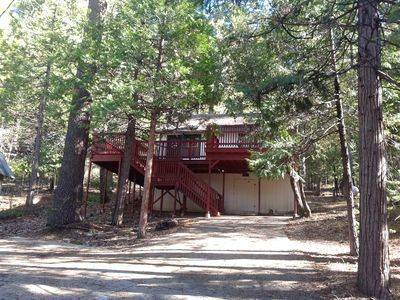 Upstairs is a large loft bedroom with a half bath. 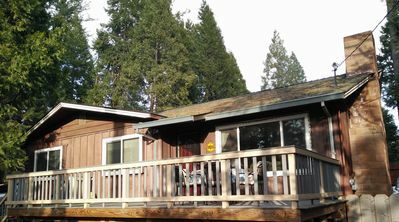 Downstairs is a large family room with two futon couches, another full bath and laundry. 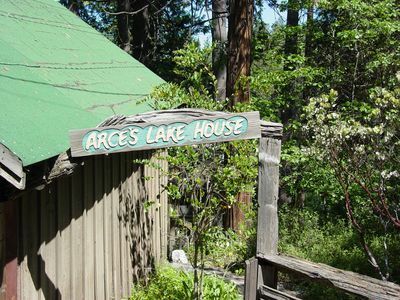 The Stanislaus National Forest is Hearthstone’s backyard. 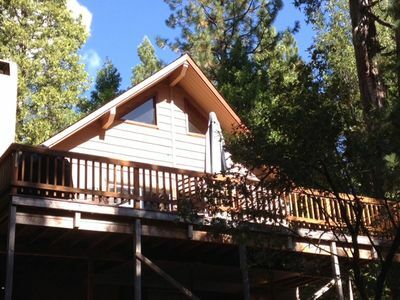 Discover great hiking at various difficulty levels or just hang out on the deck and enjoy the view and sounds. 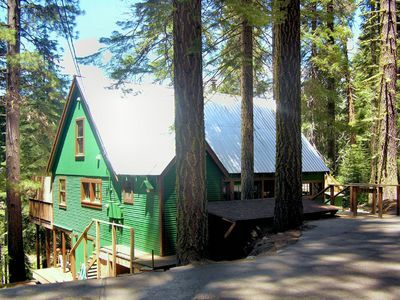 The cabin has games, puzzles, and a hammock. 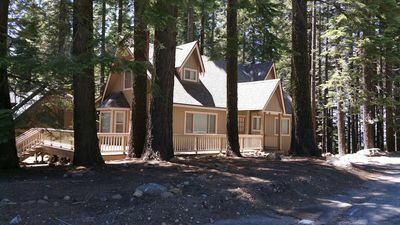 Pinecrest Lake, which is 15 minutes away, offers swimming, boat rentals (kayaks, paddle-boats, canoes, sailboats, and motorboats), and great fishing. 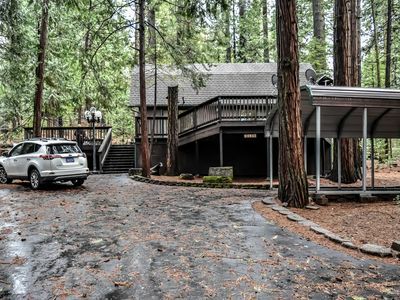 The small town of Mi-Wuk Village is one mile away and Twain Harte has great shopping just three and a half miles down the mountain. Enjoy wildflowers in the spring. 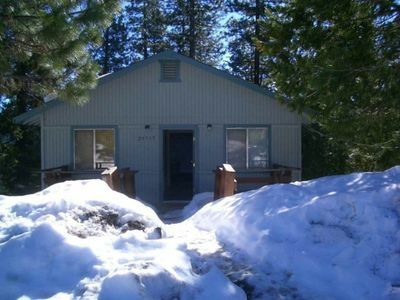 And in the winter, Dodge Ridge Ski Resort is only 15 miles away. 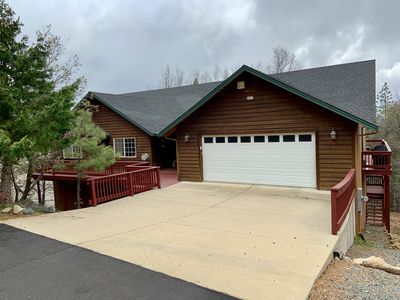 Cross-country skiing, snowmobiling, and sledding are nearby. 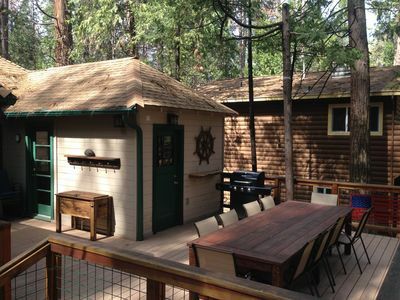 The cabin easily sleeps 12 people. 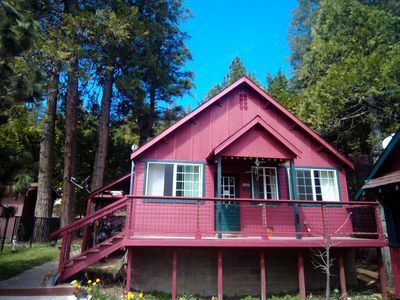 Each bedroom on the main floor has a queen-size bed. The loft bedroom has a queen-size bed and two twin beds. 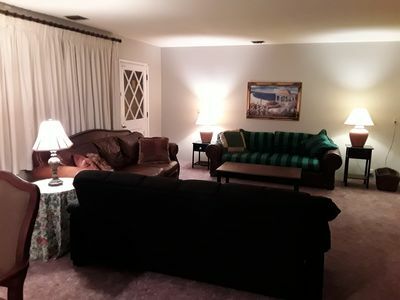 The two full-size futon couches in the family room make into comfortable beds. 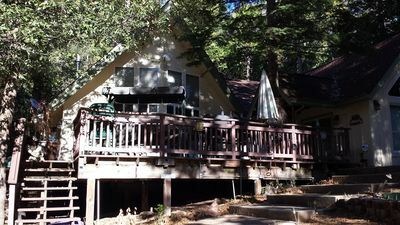 Each bed has a warm, down comforter and soft pillows. There are plenty of extra blankets. While we do have linens for your use, we recommend you bring your own sheets and towels so you don’t have to do laundry before you leave. The well-equipped kitchen is stocked with basic spices, oils, and condiments and has place settings for 12. We have sleds in the winter and iner tubes for the summer. A washer and dryer are in the family room. There is a DVD hooked up to a TV (no cable or sattelite). You can bring movies or rent them at the Twain Harte Market Red Box. 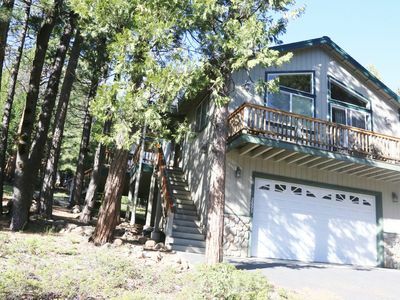 2 BR / 2 BA with Loft, Sleeps 8-10 Near town; Twain Harte Lake Privileges! 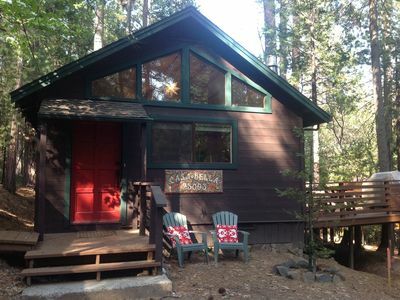 Spacious modern cozy Cabin 15 mins from Pinecrest Lake and 1.5 hrs to Yosemite.